Each year, at the Gathering of Friends, the nice guys from Czech Games Edition arrive in the States with their newest prototypes. We here at the Opinionated Gamers have developed a tradition where we outline the upcoming releases based on our plays at that invitational convention. While some of our regular CGE fanboys were not able to make the Gathering this year, we have taken a group approach to the preview this year. Please remember that all of the games are still in prototype form (though a few seem very close to a finished state) – and any details here are obviously subject to change as the development process continues over the next few months in Europe. I know that Petr and the team from CGE get a lot of valuable feedback from the week, and likely incorporate some of those comments into the final version of the game. New starting cards. 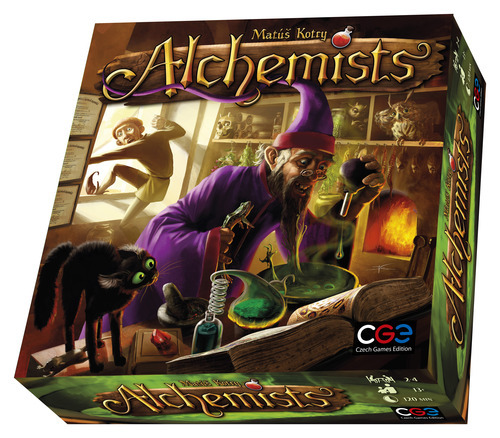 The base game had only two ways to start: the Apprentice variant, which starts you with 3 ingredients, 2 gold, and 1 favor, or the Master variant, which starts you with one fewer ingredient than the Apprentice variant. This ensured the game was balanced, but tended to create certain repeated tactics across games regarding one’s initial moves. The new starting cards give players wildly different starting coffers, which makes the early game a lot more wild. You might start one game with 9 ingredients, or another game with a starting artifact and -7 reputation. New order space tracks. In the base game, to determine player priority and order, players angst over which combination of favors and ingredients they wish. With the expansion, you might find yourself competing for gold or even avoiding unused cubes. New theory types. In the base game, if your first two potions ended up being the same color, you often wouldn’t be able to come close to publishing a correct theory. But now, instead of publishing theories that link a specific ingredient to a specific alchemical, you can now publish theories that link a set of ingredients to specific colors. For example, you might publish a theory that says “toad and toadstool have a positive red while mandrake and feather have a negative red.” This allows certain initial mixes to have a viable publishing path that was previously unavailable. The golem. If you feel that alchemistry is too simple now, there’s a new task about activating a golem; the first players to activate the golem earn substantial victory points. The golem reacts to atoms of specific color and size (not sign), but activates to atoms of specific color and sign (not size). You’ll have to test the golem’s reactions, and map those reactions’ atoms’ size to atom signs to figure out how to activate it. Clear as mud? Running tests on the golem provides royal favors, which allow one to buy certain artifacts or check out books from the royal library, which gives yet another source of alchemical information — the parity of a specific ingredient. One can write essays about the golem for more end-game victory points as well, although unlike theories, you can’t crib off of other player’s writings as easily. Overall I felt that the expansion gives a good dose of variety to the base game, while still staying true to the base game’s nature. If you weren’t a fan of the base game, then this expansion won’t make you like the game any more — it doesn’t add any fundamentally new game mechanics. But if you liked the base game and was feeling it was getting a bit predictable, than this expansion should feel quite welcome. CGE likes to do unusual mixes in games–a Civ game without a board, a deduction/worker placement game–and Adrenaline continues this practice. It’s a First Person Shooter (FPS) Euro! The challenge, of course, is to make that bizarre pairing work. The modular board shows different rooms. Your character has a set number of actions to choose from each turn, which allows him to move around, pick up weapons or ammo, and shoot at other players. Each weapon has different rules for what ammo it uses (colored cubes), its range of firing, and what damage it does. Combat is kind of bloodless: players take damage points, but when they die, they get spawned elsewhere on their next turn, with no loss of equipment. In fact, being shot at can be beneficial: once you take a certain amount of damage, it unlocks more powerful actions that you can take. This is supposed to represent an adrenaline surge; hence the name of the game. So why bother to shoot at other players? Because Adrenaline, at its heart, is a majorities game and the things you’re trying to get majorities in are opponents’ damage levels! When a player’s hit point total is exceeded, you check to see how much damage each player did to him (this is shown with cubes). Most damage scores the most VPs, with second and third place players scoring fewer points. There are also some bonus VPs for scoring the killing blow. When the victim spawns, he’s worth fewer VPs the next time around; this is sort of a catch-up mechanism, so that the same poor sap doesn’t get shot at again and again. When a certain number of deaths occur, the game ends and the player with the most VPs wins. So what did I think? I should mention that, even though I love CGE’s games, I am not the target audience for this design, since I never play FPS’s and have no real interest in them. That said, the rules are solid and they do a good job of applying Euro mechanics to an FPS setting. There’s also pretty good variety in the weapon types and effects. The real question is if this unusual pairing works. At this stage of its development, I’m not sure it does. An FPS should have a certain level of gleeful mayhem, as you blast everything in sight. Our game didn’t have any of that. Mapping out your best move was enjoyable and it was definitely fun to pepper an opponent with just enough bullets to take first place in his personal death pool. But the gameplay was far more sedate and contemplative than you’d expect given the theme. Plus, as a Eurogamer, I still felt a little bad when I was shooting at a fellow player, even though they didn’t suffer at all from their demise. So to me at least, the FPS/Euro mix feels like a somewhat uncomfortable marriage. Hopefully, they’ll be able to make those two work better together as they refine the game. The game got mixed reviews from my fellow players. One guy loved it and said he’d buy it now if it was available. Another lady seemed to enjoy the gameplay, but afterwards said there wasn’t enough there to make her want to buy it. The most intriguing case was the fourth player, who said this should be his dream game, as he’s a big fan of both FPS’s and Euros. And yet, he felt the game didn’t have a sufficiently high fun factor. He was agonizing while giving his impressions of the game, desperately trying to come up with the missing element that would make this game be the perfect pairing he thought it could be. That showed me that CGE has a good idea here, with plenty of promise. The question is if they can develop it enough to make it work or if they will literally shoot themselves in the foot. Codenames: Pictures is the next version of this critically acclaimed release. In this version, the cards have illustrations on them instead of words. The rules pretty much are the same as the base version. The pictures in the prototype are all black and white, and they tend to have mutiple elements which can be clued to… (see the example set below). In the version we played, the setup used fewer target cards – most of the layouts had 20 or 21 cards, and there were a commensurately lower number of red and blue answers (either 6/7 or 7/ 8). The games go by a bit quicker as a result, but that’s not a big deal for me because sessions of Codenames are usually sets of 3 or more games as we just cycle through the players at cluegiver. The other exception to the current rules is that the rules about taboo words are more lenient… As there are no words on the target cards themselves, you are not restricted in what you can use in your clue. This does tend to make a final clue in a set a bit anticlimactic as you can pretty much use the word for the central theme of the picture (pig, cake, barrel, etc.). While the components were not set in stone, the box that we played with had enough red/blue answer cards to allow for playing with the original rules of 25 cards on the tableau. I suppose that there could be some possibliity for a hybrid tableau of pictures and words as well – though the cards are different size. The new cards were a pleasant version to play with, and certainly made it a bit easier to play with the group there which had many gamers who did not speak English as their primary language. And while there were no kids there (a longstanding Gathering rule), I think that this version would also go over much better with some younger kids as the premium of vocabulary knowledge is lessened with the pictoral cards. I think that I personally prefer the original cards with the words on them as they seem to allow for more clever clues, but as the many multiple games at GoF showed, the pictures actually seem to be better for large groups and wider participation – so this is a sure-buy for me when it’s available. Larry’s Comments: My feelings about Codenames Pictures are similar to Dale’s. I much prefer the original because words lend themselves to more interesting and more clever clues than the pictures do. After all, language is so wonderfully plastic! I’d still be happy to play the pictures version, but while Codenames Pictures is a good game, the original Codenames is a great game! 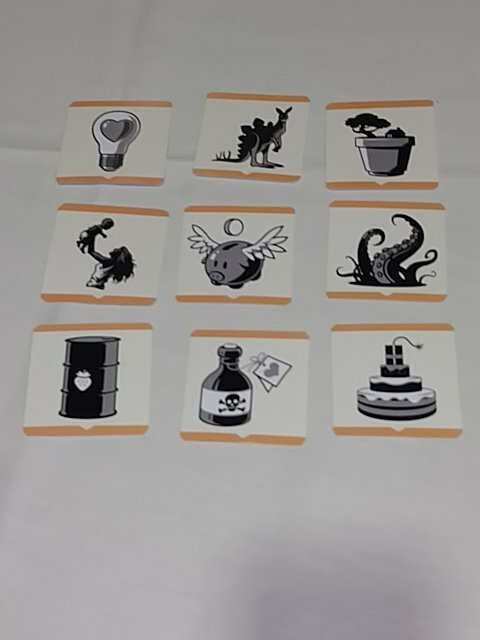 So many people were trying out the pictures version early on at the Gathering that I was a little fearful that it would be preferred over my beloved original Codenames. But soon after Dale left, games of Codename Pictures seem to plummet and by the end of the con, it was rarely seen. So while I suspect CGE will do well with the pictures version of the game, I doubt it will turn out to be a Codenames assassin. Perhaps not the best news for the publisher, but very good news for me! This entry was posted in Gathering of Friends, Preview. Bookmark the permalink. 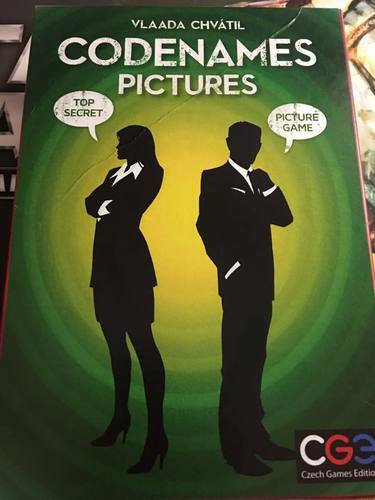 It is a bit disappointing to hear that the codenames pictures is less enjoyable, especially the final clue bit. I am a fan of the word game but thought the pictures would a) allow for even more creative examples such as when you play a game of dixit and b) make it easier to gateway in new players, pictures just seem more inviting to the uninitiated I think. Seems they could have saved it a bit by still printing the name on the card and making the words taboo… easy fix sadly overlooked… somewhat disappointing.